Easter fast approaches, and this joke seems to be the most overly used one when Easter, The Easter Bunny, and baskets are involved. So today, my joke is about the joke, rather than using the joke. The St. Patrick’s Day leprechaun mascot tries to relate an overused joke to the Easter Bunny mascot. 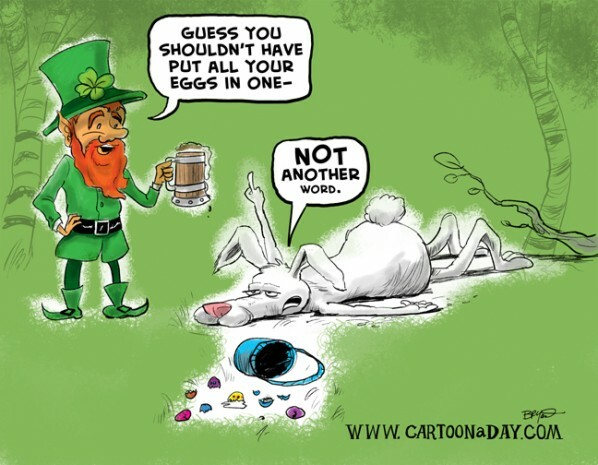 Inspiration: Cute cartoon featuring The St. Patrick's Day leprechaun mascot tries to relate an overused joke to the Easter Bunny mascot.